The highly anticipated cookbook from the immensely popular food blog Minimalist Baker, featuring 101 all-new simple, vegan recipes that all require 10 ingredients or less, 1 bowl or 1 pot, or 30 minutes or less to prepare Dana Shultz founded the Minimalist Baker blog in 2012 to share her passion for simple cooking and quickly gained a devoted worldwide following. Now, in this long-awaited debut cookbook, Dana shares 101 vibrant, simple recipes that are entirely plant-based, mostly gluten-free, and 100% delicious. Packed with gorgeous photography, this practical but inspiring cookbook includes: - Recipes that each require 10 ingredients or less, can be made in one bowl, or require 30 minutes or less to prepare. 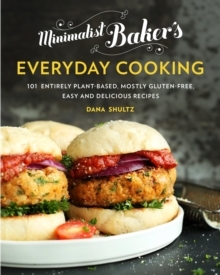 - Delicious options for hearty entrees, easy sides, nourishing breakfasts, and decadent desserts--all on the table in a snap - Essential plant-based pantry and equipment tips - Easy-to-follow, step-by-step recipes with standard and metric ingredient measurements Minimalist Baker's Everyday Cooking is a totally no-fuss approach to cooking for anyone who loves delicious food that happens to be healthy too.